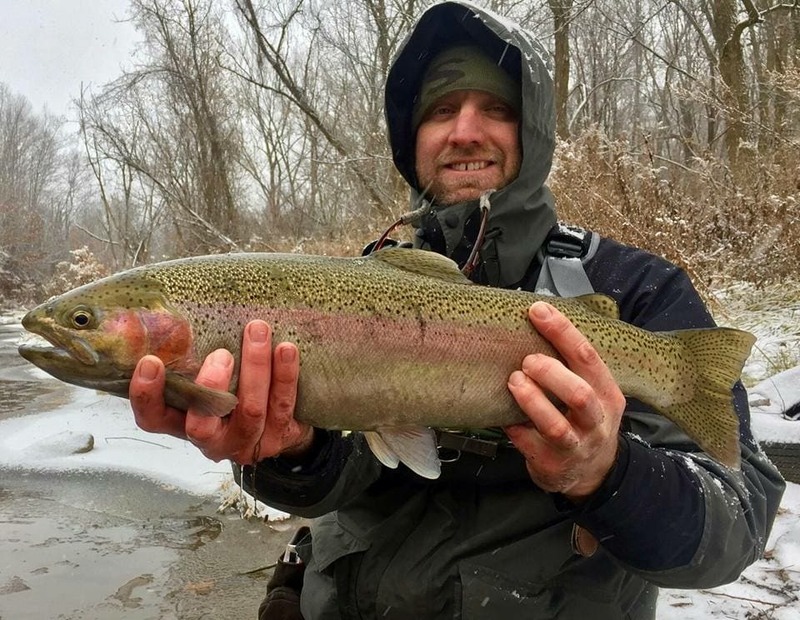 Since I moved back to Western New York and Nate and I started up Brookdog Fishing Company, I’ve been able to fish – A LOT – more frequently than ever before. I’ve also had the privilege of putting clients on fish and I’m finding it as pleasurable (if not more so) than fishing for myself. Seeing their eyes light up after the hookup, the fear and excitement on their faces as they fight the fish and the elation when the fish ends up in the net. All this time spent on the water angling has made my wandering mind ever the more philosophical. Yes, this is going to be another one of those essays but I’ll try not to get too deep – your welcome, Tim (my bro likes to keep it simple). 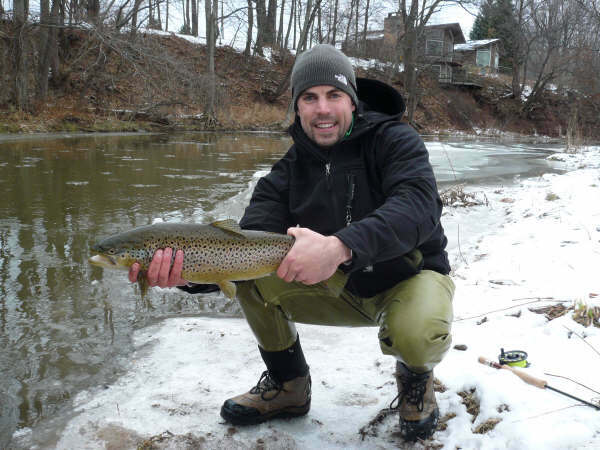 While Nate, Tony Lohr (of 85th Day Angling), and I were fishing for steelhead and brown trout on a small, Lake Ontario tributary the other day, I realized that I was more calm while fishing than ever before. This sense of serenity dramatically affected my perspective of the day and the eventual outcome. Here’s the kicker – I really didn’t care too much whether or not I caught a fish. I was truly content just being out there. Quick disclaimer: as a guide and charter captain, I am DEFINITELY NOT advocating this mindset. I believe some sense of urgency and responsibility are essential when you are with paying customers – both for keeping you sharp and ensuring you remain focused on your clients’ best interest. I’ve only been guiding a short while now, so I recognize the way I currently handle business might change. That being said, there is always a sense of urgency and a twinge of stress (just enough to make me sharp), when I’m with clients and I don’t want that to go away. I hope that they all see me as a calm, laid-back cat, that has their best interests in mind and that I truly care about their experience. I also hope that calmness is infectious – after all, isn’t that why they’re fishing in the first place? Back to the point at hand, unless you’re being paid to fish, being stressed out while fishing seems counterproductive. What sparked the idea to write this was a series of conversations Nate, Tony, and I had on the banks of that little Lake Ontario trib I mentioned above. Somehow we ended up talking about how/when we figured out Santa wasn’t real, what we love about calm winter days, and the surreal scene caused when big snowflakes start falling. The last time I fished this particular creek was probably 3-5 years ago (honestly, I can’t remember but it had been at least that long) and there is no way Nate and I would have gotten into conversations like that WHILE FISHING. This is my brother, Tim, on that same day…back when he used to fish. Look how happy he was! Back then, I was still on active duty and came back to WNY infrequently. The schedule was always hectic on those visits and every time I fished that creek (and others like it), there was always an element of stress since my time was limited and I really wanted to catch fish. Because he realized my time was limited, Nate often ceded prime pools or runs to me to give me the best shot at catching a fish. Although I appreciated the gesture, I often experienced a twinge of guilt as I knew his time was precious, too. 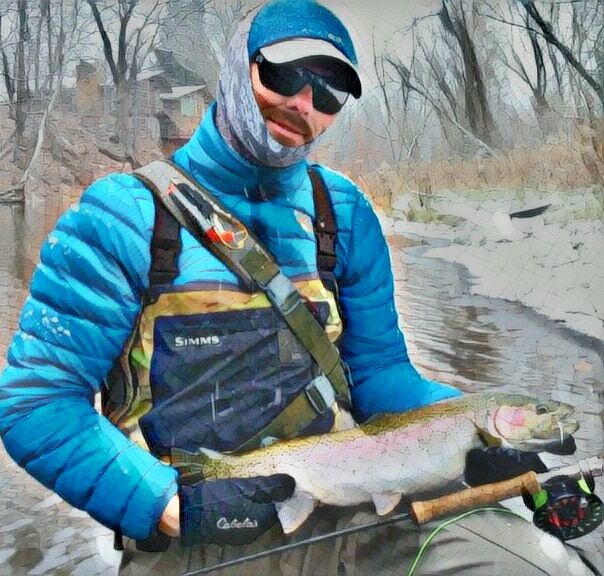 More times than not, we ended up bringing at least a few fish to hand on these outings but I rarely walked off the creek feeling relaxed or fulfilled. On this last outing with Nate and Tony, those old feelings of urgency that I experienced when I last fished that creek crept up on the approach as if from some sort of primordial infection (sorry, that’s the first phrase that came to mind – I’m sticking with it and I hope you understand). Those feelings quickly subsided and I reached a state of calm as I watched Nate and Tony rig up and BIG snowflakes began to fall. We caught fish – not a ton of them – and we really didn’t care. The water was low and concentrations of fish were really spread out. Oh yeah, there were 3 of us – not an ideal number of anglers to tackle a small creek. We knew all of this going in and still went out. You might think that’s crazy. We would say YOU’RE crazy for thinking that’s crazy. It’s all, as Tony would say, “Whatever.” In other words, our minds were in the right place for the occasion and we had a good time. 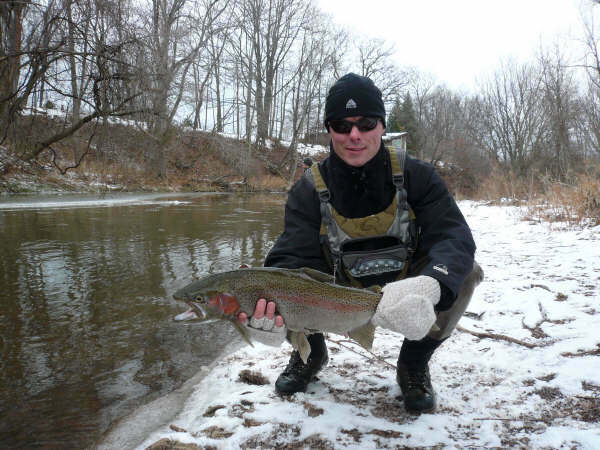 Tony Lohr with his first legit steelhead. He is loving his winter vacation up north from MD. This was taken on the same day we had the conversation referenced above. Thoughtful essay, thanks for writing. There is a great deal of truth in the statement that many folks fish their entire lives without realizing that it’s not the fish that they are after. I think that one of the great things about fly fishing can be the Zen attitude that it can engender. Glad you’ve found it at your young age. Thanks for the comments, Cliff. I wish the younger guys could learn it this a lot earlier on – there’d be a lot less drama on social media!